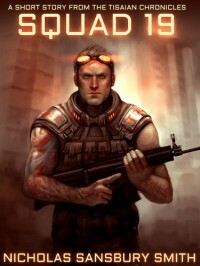 This is a great, fast paced novella that gives a complete glimpse into the world of the Biomass Wars series from the perspective of Squad 19's leader, Obi. It tells the back story of Obi's necklace and gives more details about Squad 19, life in the Wastelands and the TDU. There is a good deal of heart pounding action as well as emotional pull in this short story, and it is a good companion to the series.